- Automatic payment with a credit card (preferred) - A valid credit card must be on file. Tuition will be charged on the first of each month. This payment option will never incur a late fee provided funds are available. Please select on auto pay schedule towards bottom of this form to enable automatic draft for ongoing tuition payments. - Personal monthly payment via cash, check or credit card - Tuition is due by the first of each month unless the studio is closed on the first, in which case payment can be made on the following business day. Pre-payments are accepted. - Homeschool - We work with Butte CORE, Inspire and Sutter. Work with your homeschool program for approval and payments. Please check which months/dates your program does and does not cover. They usually do not cover summer time or any additional fees such as annual and performance fees. All tuition dates, policies and drop procedures are the same for these students. - Annual performance fee - The performance is held in early June, the weekend after Chico Unified School District is dismissed for the summer. Please save the date. - The session runs from August 1 - July 31. Studio closures, in general, follow the Chico Unified School District calendar. Tuition is payable monthly and remains the same regardless of the number of weeks in the month. The only automatic drop is at the end of the session, July 31st. - Tuition is late after the 10th of the month and will be assessed a $15.00 late fee. A $25.00 fee will be assessed on all returned checks. - FOUR WEEK WRITTEN NOTICE IS REQUIRED PRIOR TO DROPPING CLASS. You will be billed accordingly. The four week written notice may be waived due to illness or injury with a physician note. Class enrollment may be held with paid tuition during the student's absence. Class placement is not guaranteed without paid tuition, however, a student returning after a medical absence will be given priority placement on waiting lists. Transfers are not guaranteed and four week notice will be required if space is unavailable. This includes all homeschool program students. Please note, no drops are permitted in June after the performance. - Your automatic payment or personal monthly tuition may change due to occasional fee increases and/or class changes in which case you will be notified prior to the first charge increase. - There are no refunds for missed classes. If initial or final class falls during the middle of the month, single class fees will be assessed. Tuition is not prorated. - Performance fees are in addition to tuition fees. There is one paid performance each year held the weekend Chico Unified Schools get out of school in early June. Save the date accordingly. This is non-refundable except due to illness or injury with a physician note. The student must be enrolled in class at the time of the performance. No drops are permitted in June after the performance. - Should tuition become outstanding for four weeks without notification of drop status it will be assumed that the student has dropped class. The student will be billed for the last four weeks including applicable late fees. - Makeup lessons are available for missed lessons in some classes. This is not an option for all classes and is only provided as a courtesy when possible. Makeup lessons are not allowed in full classes or in classes with only one class time. - Permission is given to use the student's image in Kinetics promotional materials. The undersigned acknowledges receipt of above tuition policies, accepts financial responsibility for student as named and authorizes KAD to have the fees related to classes charged to signer's credit card as indicated above. Permission is also given to use the student's image in promotional materials. 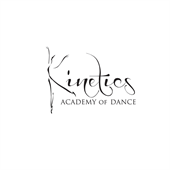 Kinetics Academy of Dance, it's instructors or the owners of this facility may not be held liable for any injury or accident sustained as a result of participation in this program.